In last month's Axiom AudioFile newsletter feature "Secrets of Amplifier and Speaker Power Requirements Revealed" (August '03), we concluded that using a pair of M80ti speakers at a distance of 12 feet in an average room, and attempting to reproduce the 109-dB peak sound pressure levels of a grand piano playing crescendos, would require an amplifier capable of at least 200 watts per channel output to handle the musical peaks. This would exceed the power output capabilities of most current A/V receivers. "From all this, you can see the huge power requirements inherent in reproducing real-life acoustic sound levels in average or big rooms. The M80ti's are tested to levels of 1,200 watts of input power so they come very close. But the truth is that if we are seeking real-life acoustic sound levels in our listening rooms, there's a very persuasive argument for very large, powerful amplifiers. And if your speakers are less sensitive (and many are), then the power demands rise even more dramatically. Sizeable rooms and greater listening distances will also increase power demands tremendously. Moreover, what many of us don't realize until we hear it, is that clean undistorted loud sound often does not sound that "loud." The key here is that in most of our home listening, there are small amounts of distortion caused by a lack of dynamic headroom. It's the distortion that makes it sound "loud" in a domestic setting. To remove those distortions and increase dynamic headroom relates to even more power. We've become accustomed to accepting some distortion with our reproduced music, because all amplifier's distortion ratings gradually increase as they approach their output limits or slightly clip the audio signals. When that happens, we turn down the volume because distortion starts to intrude on our listening pleasure, and it sounds "too loud." This month, our discussion of amplifier dynamic headroom will assume you have read and absorbed the basics of last month's feature. (Cliff notes on the side if you're just joining us). To better understand amplifier dynamic headroom, we need to look at dynamic range, and how we experience it in everyday life. On a hike in the woods, most of us know the soft rustling sound of leaves in a tree produced by a gentle breeze, a sound that measures perhaps 20 dB Sound Pressure Level (SPL) at most. And at one time or another we've experienced the sound of an orchestra or brass band in a concert hall at 100 dB SPL (or more), or of an amplified rock band at 120 dB (the latter is the maximum SPL permitted by law in a performance in a public venue). Those levels represent the extremes in dynamics that our ears can routinely register. If we were suddenly transported from that idyllic spot in the woods (20 dB SPL) to the rock concert (120 dB SPL), our ears would register a dynamic range of 100 dB. Recall that 1 decibel (dB) represents the smallest detectable change in loudness, and that we subjectively perceive a 6-to-10-dB increase in loudness as sounding "twice as loud." What is remarkable, then, is the range in loudness that our sense of hearing can encompass without pain. In fact, our ears can accept even higher levels—a jet engine at 75 feet away measures about 140 dB SPL—before the threshold of pain is reached, but for the purposes of reproducing music or movies at home, let's confine our discussion to the dynamics of musical sounds. To give you some perspective on music playback in the home, "quiet" music would fall in the 75-dB range, whereas "quite loud" music would measure about 85 dB SPL at your favorite spot on the couch. For purposes of illustration, let's go back to our example of listening to a recording of a solo concert-grand piano of Chopin piano works at average levels of 76 to 86 dB, using a pair of M80ti loudspeakers at a distance of 12 feet. According to our previous calculations, this would require perhaps 1 watt per channel of amplifier power, a modest demand for even the least expensive A/V receiver or small amplifier. If the pianist on the CD was playing Chopin's Grand Polonaise, however, and one of those spectacular chords in the bass octaves of the piano comes along, your amplifier and speakers will suddenly have to produce levels of 96 or 100 dB SPL without distorting, because Chopin's piano works have sudden and extreme changes in musical dynamics. Remember that a 10-dB increase in subjective loudness ("twice as loud") demands ten times as much power, or in our example, 10 watts, a level any receiver or amp will easily produce. But if it were a real-life orchestra playing at full tilt, and you wanted to reproduce the illusion in your living room of standing next to that grand piano, then peaks of 109 dB would be required. So getting from 96 dB to 106 dB will require ten times as much power again (10 x 10) or 100 watts per channel. The goal, remember, is real-life reproduction of that grand piano, so now we only need 3 dB more (subjectively "somewhat louder") to hit 109 dB in the living room. But twice as much power is required for a 3-dB increase (100 watts x 2 = 200 watts). All of a sudden our A/V receiver or amplifier has run out of power! How do we get that dynamic headroom into our amplifier? To answer that, we need to look at power, and how an amplifier outputs power in watts. Power in watts is the product of voltage, and current, flowing into a resistance (the loudspeaker). Voltage is the driving force, like water pressure in a hose, and it works with current, which is analogous to the rate of water flow. If the hose has greater diameter—or the speaker has less resistance to the flow of electricity, in which case it would be 4 ohms or less, rather than 8 ohms—then the amplifier voltage pushes more current through the output transistors and produces more "power." (We assume the intervening speaker cables have insignificant resistance of less than 0.3 ohms, easily achievable by using 12-gauge cables.) In many respects, it's easier to design an amplifier with big reserves of dynamic headroom to drive 4-ohm speakers, because the voice coils have fewer windings, hence less resistance to the flow of current. 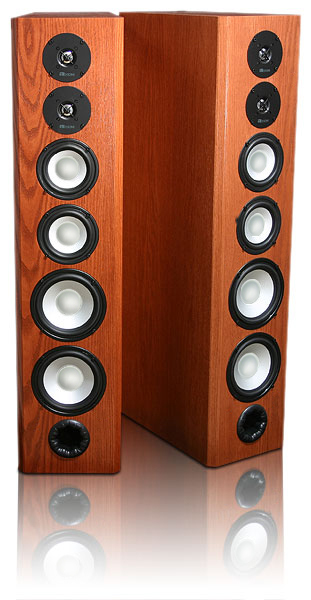 With 8-ohm speakers, you are wasting more potentially usable power in heat. Nevertheless, that power has to come from someplace, and in amplifiers it's supplied by the transformer (which connects to your wall outlet) and by capacitors, which store up the reserve electrical energy from the transformer in "joules." According to Axiom electronics R&D engineer Tom Cumberland, the source of good dynamic headroom in an amplifier "comes from having a transformer with a high-flux core that measures up to 13,000 gauss—if it's any greater, the transformer will buzz—but the higher the flux in the core, the more efficient the transformer is. That will give you lots of sustained current and instantaneous current, which is then dumped into the power-supply capacitors. So the better the transformer and the better and larger the power-supply capacitors, then the better the dynamic headroom is. "The problem with many amplifiers and A/V receivers designed for economy (the most watts for the dollar) is that they make the transformer just big enough to produce the voltage output they need [to meet sustained power output measurements into an 8-ohm load], and just big enough capacitors to supply the sustained, continuous voltage and current they need for continuous power, and then the amplifiers quit, so those amplifiers have no real headroom. On top of this, the power may be calculated to be the rated output for one channel at full power and the other five at 1/8 power. So a 100-watt six-channel A/V receiver actually only has 162.5 watts of total power or 27 watts per channel with all channels driven. The better amp builders, who design for performance (reproductive accuracy for the dollar) rather than economy, will install these big transformers with huge capacitors, so then they have all these joules of energy in reserve to produce the dynamics necessary for the music." Another important factor in dynamic headroom is that the output transistors must be very tough, and there have to be enough of them, to handle these instantaneous high-current conditions, because a great deal of heat is generated very quickly. If the transistors aren't of sufficient quality, they'll be pushed outside of the "SOA" (safe operating area) and fail. And that may happen because there isn't enough heat-sinking to keep the output devices cool under these very dynamic conditions. One hugely important factor we've ignored so far in this discussion is whether the speakers (and the individual drivers) receiving these 200-watt or 400-watt instantaneous bursts of power from an amplifier capable of 3 dB or more of dynamic headroom can handle the peaks without significant distortion. We already know that the M80ti's are tested up to 1,200 watts of input power, but many speakers when confronted with spikes of power input may suffer something called "dynamic compression." What happens is that the sudden peak of input power pushes the driver voice coil beyond the region of magnetic flux, so the voice coil—essentially the "motor" of a loudspeaker driver—loses energy and becomes non-linear. This means it stops producing greater output levels, it can't track the incoming signal accurately, and even the driver's frequency response changes. Fortunately for Axiom, our speakers have fairly prodigious peak power-handling capabilities with little or no dynamic compression exhibited, but while the 140-dB maximum peak levels may remain elusive, it is possible using amplifiers with sufficient dynamic headroom to achieve highly realistic peak dynamics in a living room. The limitation is not in the software. As most readers know, even the two-channel 16-bit CD has a practical dynamic range of a bit less than 96 dB, and the newer formats—DVD-Audio and SACD—have spectacular dynamics. A 24-bit recording has 6 dB of dynamic range for each bit, so the potential dynamic range of these recordings is 144 dB (24 bits x 6 dB), more than enough to contain the dynamics of any known musical instruments or instrumental groups. And our home theater multichannel processors, Dolby Digital 5.1 and dts, have dynamic-range capabilities similar to the CD format. In future issues of the AudioFile we'll look at the history and use of dynamic compression in studio and live recordings, and how in some ways those practices that were so common and necessary in the era of the vinyl LP and analog tape recording have persisted and may account for losses of fidelity in modern digital recordings. The real challenge that lies ahead is to design amplifiers and receivers capable of delivering huge instantaneous peak power output without distortion. Only then will our reproduced music and movie soundtracks not sound "too loud," and we'll sink back and revel in the thrilling dynamics that we've all experienced at one time or another with live music.